Most oils contain Omega 6 and 9 and no Omega 3 and those that do have Omega 3 generally provide only one of the three critical fatty acids – linolenic acid. This forces the horse’s metabolism to try and manufacture the other two elements, eicosopentanoic acid (EPA) and docosohexanoic acid (DHA). A highly inefficient process, it is unlikely at the recommended feeding rates for other oils, that any benefit is derived for the horse. 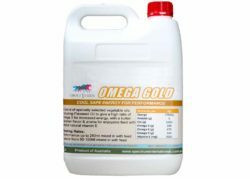 Omega 3 oils which only contain linolenic acid would have to be fed at 5 to 10 times the rate, or more, to match OMEGA GOLD – obviously an expensive and impractical course.